IBBC was a partner organisation for the 6th Annual Sulaimani Forum entitled ‘Iraq and Its Neighbours: Toward a New Regional Order’ on 6 & 7 March in Sulaimani, Iraq. 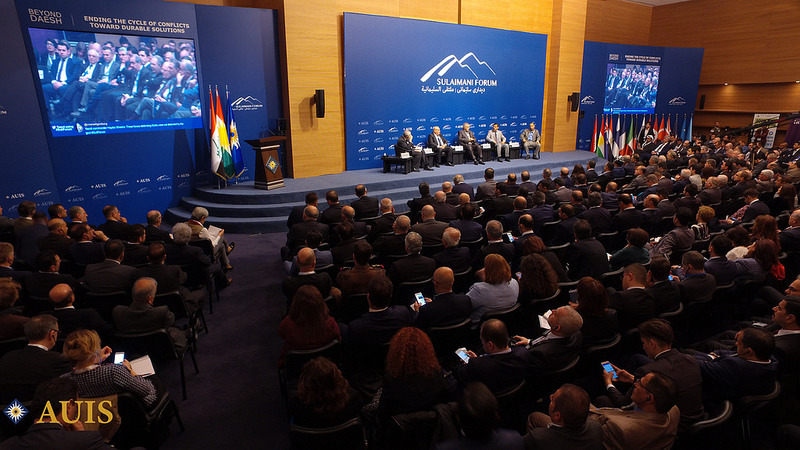 The Forum featured key policymakers, stakeholders, and experts from across the region for two days of thought-provoking debates and discussions on the most pressing issues facing the Middle East. This year, conversations moved beyond conflict analysis, the traditional narrative of the event, to explore factors necessary for stabilization, good governance, and economic growth in Iraq and the broader region. Topics on the agenda included the major challenges facing Iraq and how to address them: the youth population; energy infrastructure; private sector growth and investment; rehabilitation of liberated territories; water scarcity; and the protection and empowerment of minority religious and ethnic communities. The Forum welcomed H.E. the President of Iraq Dr. Barham Salih, Deputy Prime Minister of the Kurdistan Regional Government H.E. Qubad Talabani, Former Prime Minister Haider Al Abadi, Minister of Electricity Luay Al Khateeb, Minister of Culture Abdulamir Al Hamdani, President of the National Hikma Movement Ammar Al Hakim, among other dignitaries and officials from the federal government of Iraq and the Kurdistan Regional Government. Directors and senior fellows from Chatham House, Carnegie, the International Crisis Group, Middle East Institute, East West Institute, Brookings Institution, and Clingendael Institute. The senior leadership of UNAMI, UNITAD, IFC, the World Bank, and major companies such as IBBC Members GE, Siemens, BP and Chevron and many more. IBBC was pleased to partner for this important event in the Middle East calendar, which brought some of the most influential voices in the region to discuss ‘Iraq and its Neighbours: Toward a New Regional Order’.